The iPhone Simulator is a big part of any iOS developer’s workflow, but running any apps in the simulator that weren’t put there by Xcode can be a major pain. Generally the simulator is considered a developers tool, so what’s wrong with installing apps as part of the build process? At this point, based on the combined experiences of Joel and I, it seems commonplace for one or many non-developers to be part of the development process of an iOS app. Managers, Designers, Animators, Sales – they probably all want to run the latest build on the simulator, without all the difficulties of getting a build environment setup. To solve this, we’ve put together a little utility – Sim Deploy. 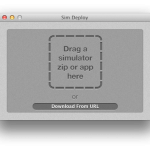 It’s nothing fancy, it does what it says on the box: it provides drag and drop installation of simulator builds. 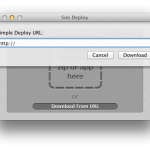 It also allows for downloading a build from a remote URL. To provide a simple, and as close to an OTA experience, we added support for a custom URL scheme. This means new builds can be provided by simply asking a person to click a link. I know, I know — Fancy. If you ever send simulator builds around, give it a shot, and give us some feedback. We’ve already got a couple more little tools in progress that should help this utility being even more useful than we think it already is – but we’re more than happy to help improve workflow cases we haven’t though of as well. 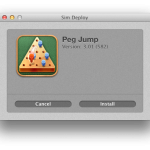 This entry was posted in Software and tagged Distribution, iOS, Sim Deploy, Simulator, Software. Bookmark the permalink.